We finally got around to biking the back bay loop in Newport Beach today. We started on Balboa Peninsula and took the Ferry across to Balboa Island for 1.25$ each. You pedal across the Island and cross the bridge on Marine Avenue. Make an immediate left onto Bayside and it’ll take you across Pacific Coast highway. There is small pedestrian bridge that crosses the harbor onto the trail on Backbay drive. It doesn’t show up on Google maps unless you zoom all the way in on it. Backbay Drive winds through the Newport Beach ecological preserve and wetlands. Its a nice paved trail and there were a ton of people bikng and jogging and we never saw a single car. Once we hit the end of the wetlands, we decided to keep biking North along the San Diego Creek bike trail just to see where it went. The Creek Trail is paved and well maintained, but its kind of drab compared to the Newport Wetlands area and Balboa Island. At 12 miles in, we took a water break at the Harvard Athletic Park in Irvine. We decided to turn around and head back to Balboa Island for dinner and we ended up fighting a nasty headwind. Thankfully, the bike trail is almost completely flat, because it literally felt like I was dragging an anchor on the ride home due to the wind. We opted to take the identical return route and avoid the loop on the back bay to save some time and avoid the hill. At the Village inn on Balboa Island, we ate dinner, drank margaritas and watched Watched Louisville beat Michigan State to a pulp in the sweet sixteen game. We ended up doing a little over 23 miles round-trip, but it felt worse because of the headwind. 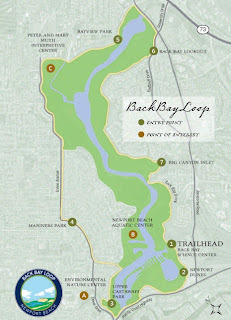 Next time I bike the Newport back bay, I’m going to head a little further down San Diego Creek in Irvine and do the Orange County zoo in Irvine Regional Park.